Keeping with its pioneering tradition of cross-platform programming, CNN will allow CROSSFIRE viewers to choose their interactive second-screen experience via Twitter, Facebook, or CNN.com/Crossfire to vote via mobile, tablet, or desktop platform and weigh in on the issues debated on the program. In a first for a television news program, CROSSFIRE will offer viewer voting using Poptip technology that tallies votes of CROSSFIRE’s daily debate question. Via Twitter using #CrossfireReturns, on CNN’s live blog, or by commenting to CNN’s CROSSFIRE page on Facebook, users will be able vote in real time. Results will be announced during the program. Tonight, users will be able to join in the debate with hosts Newt Gingrich and Stephanie Cutter and guests Sen. Rand Paul (R-KY) and Sen. Robert Menendez (D-NJ), by voting on whether Congress should approve the president’s plan to strike Syria. User results will air during the premiere program. The first edition of CROSSFIRE will debut at 6:30p.m. ET, immediately following The Situation Room with Wolf Blitzer, which will air at 6:00p.m. ET, with Wolf Blitzer’s interview with President Barack Obama. On CNN.com/Crossfire, viewers can join the conversation and follow along in the live blog powered by Scribble Live, which will feature highlights from the debate on social media, plus addition videos, articles, images and real-time highlights from the show. 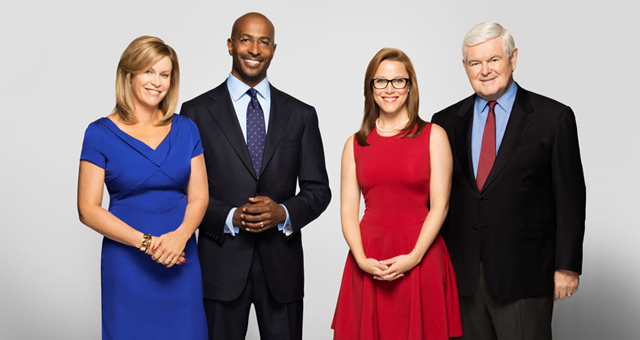 Gearing up for Monday’s premiere, the CROSSFIRE hosts have also released exclusive opinion pieces at CNN.com/Opinion. The web site and live blog are both optimized for desktop and mobile. Viewers can watch clips from the show and learn more about CROSSFIRE in a special new CROSSFIRE section of the CNN apps for iPhone, iPad, Android phones, and the BlackBerry Z10 and the BlackBerry Q10. Each day of launch week, GetGlue users can check in and share to their social networking sites that they are watching the return of CROSSFIRE. Once checked in, users can unlock limited-edition premiere stickers. The custom sticker set features an exclusive premiere sticker and five individual host stickers.